The dosas are excellent, you have to get one with your meal. The staff are very friendly; on one particular occasion we arrived for dinner on an Indian day of celebreation so the restaurant was closed. The owner (who lived nearby) came out to greet us and said that if we were really disappointed, we were welcome to part take in his family feast! We didn’t, but felt very welcomed. It’s cheap and cheerful so it’s easy to just order everything in sight and have the full Indian experience. The Daal Mahkni is to die for, and it seems they really thrive on vegetarian options. Fantastic little place right down Soi 18, so it’s out of the way, but definitely a must do. The mausoleum is grand. It’s a majestic structure that stands alone in front of a vast lawn and is heavily guarded. Such a gesture helps put into perspective just how important Ho Chi Minh was to the Vietnamese people, how highly regarded he was. 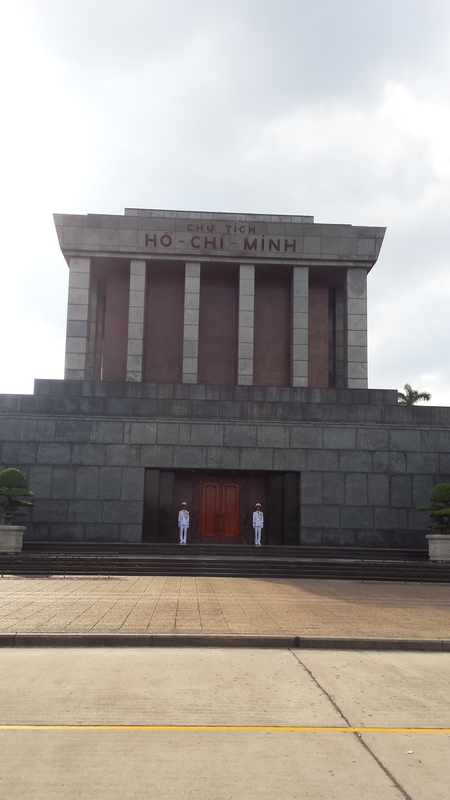 It’s worth seeing, and it’s a good idea to pack more local sight seeing into the day as well, considering it’s close to Ho Chi Minh’s residence, the Ho Chi Minh museum and botanic gardens. We walked there from the Old Quarter, but caught a taxi back as it was a bit far in the heat. Careful, the fares are always more expensive than originally quoted. As a western traveler, I felt it important to witness this aspect of history, to learn what I could. This hipster café is on the main drag, but not right in the thick of town. It’s worth it though. The cakes are great and the coffee is artisan. We went there for brunch and found it a bit pricey for a smashed avocado with feta, but what can you do these days. Options for health-food people, vegetarians, gluten free and everything in between. Free-flowing ambience and channeling indie beach vibes. Go for the coffee and cakes, I recommend the Nutella brownie and the lemon meringue cupcake. This restaurant was exactly what we needed, when we needed it. We came here after exploring the Temple of Literature. We were super dehydrated and in need of aircon (a bathroom and wifi) and we stumbled across this place. It’s a franchise, so don’t expect a unique home cooked experience. However, the food is excellent, well priced and really hit the spot. My vegetarian and food allergy friends were able to navigate the menu and find something they liked, and I was very satisfied with my noodle bowl. Solid recommendation and close to tourist attractions. 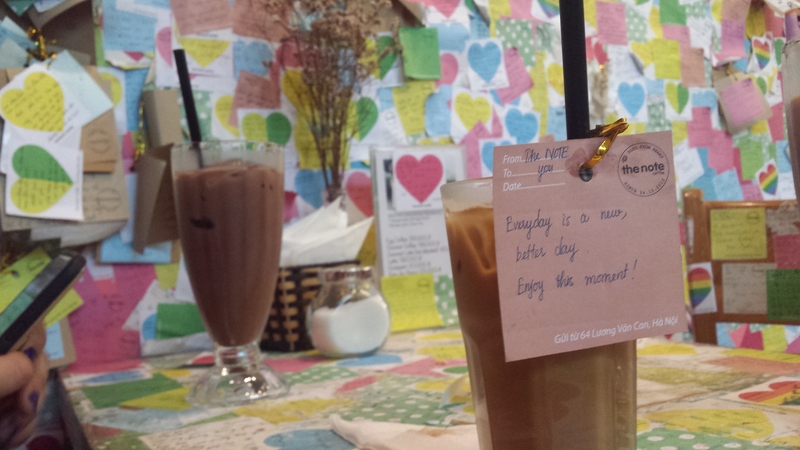 This little café is a traveler’s haven in Hanoi. Right on the biggest intersection in the Old Quarter, this cafe overlooks Hoan Kiem Lake. It’s slim, so if you’re not looking for it you may miss it. The staff are excited, keen to strike up a conversation, practice their English and provide you with tourist tips. The cakes and banh mi are enough for a snack, but the real drawcard are the beverages. The iced drinks are flamboyant and refreshing. I recommend the Iced Coffee and the Iced Mint Chocolate. However, the real star of the show is the aesthetic. 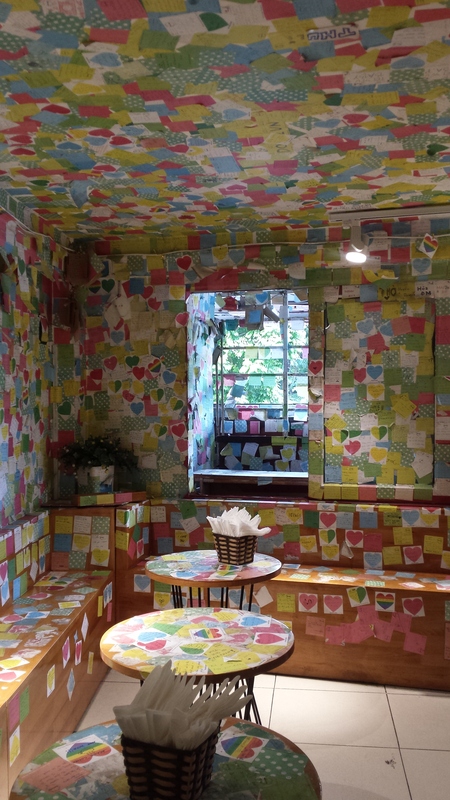 Three floors of the cafe are covered, wall to wall, in post-it-notes and sticky notes from travelers dating back to 2012. Little messages, heartfelt memories, reminders, helpful hints make for hip vibes. Definitely recommend. We chose this Water Puppet theater because of its close proximity to the centre of the old quarter, and the fact that it had regular viewing sessions. It’s well priced for tourists and very popular, so buy your tickets in the morning if you intend to go in the evening. The seats are allocated, so don’t be intimidated by the thick crowd that enters/exits as the shows change over. I had a great night. I think it’s a must do in Hanoi to be honest. I’ve seen Wayang Golek and Wayang Kulit puppetry in Indonesia and it wasn’t dissimilar. Local legends brought to life with live traditional music. 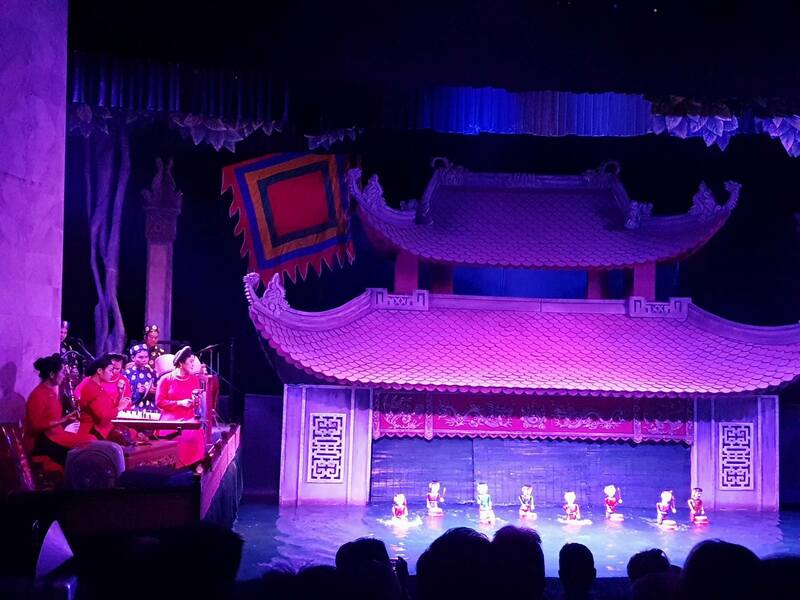 The water puppets are very impressive and the stories (although not in English) are very easy to follow and engage with. Such fun! It’s an night of wholesome family entertainment.